Coconut oil can be used in multiple ways for multiple benefits, as it has deep moisturizing, nourishing and antimicrobial properties. For centuries, coconut oil has been used in traditional cuisine and medicine to boost health, skin and hair naturally. This rich, creamy oil consists mainly of fatty acids that deeply nourish and moisturize your hair and scalp. However, its benefits do not end there. Coconut oil also has potent antibacterial and antifungal properties that make it an excellent remedy for treating dandruff and also skin problems like acne. Additionally, the oil also contains vitamin E and lauric acid that serve to hydrate, rejuvenate and enrich your hair and scalp. We have come up with six easy-to-prepare coconut oil hair masks to solve all your hair problems ranging from hair growth to repairing damaged hair and taming frizzy locks. 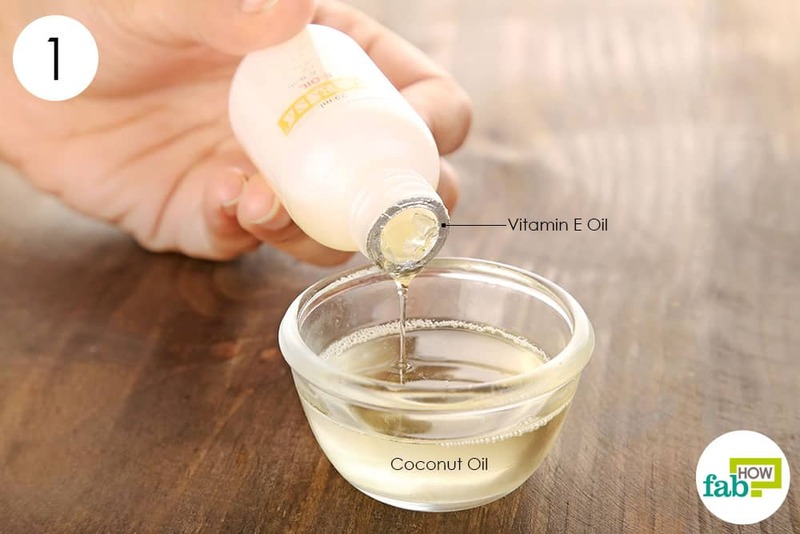 To derive the maximum benefit, always heat up the coconut oil before application. Note: To easily wash off the hair mask, always cover it with a shower cap. It helps to retain the moisture and prevents the mask from drying out. Aloe vera gel has potent antimicrobial properties. It soothes and cools down inflamed skin, controls any scalp infections and nourishes hair follicles to promote hair growth. For best results, use pure aloe vera gel extracted directly from the plant. 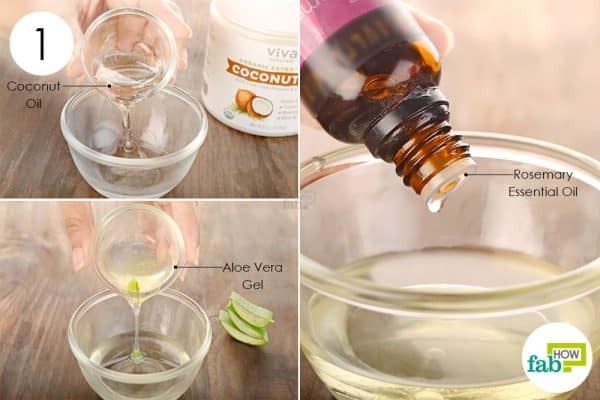 It’s easy to extract and store your own aloe vera gel. Rosemary oil nourishes hair follicles and also promotes blood circulation in the scalp, leading to faster hair growth. Put 1 tablespoon of extra-virgin coconut oil in a mixing bowl. Finally, add 5 to 7 drops of rosemary essential oil. Whisk everything together to get a smooth blend. Dip a clean hair dye brush into the hair mask and apply it on your scalp, especially around the roots to promote hair growth. Once the scalp is completely covered, apply the mask on your hair strands, covering them from the roots to the tips. Leave it on for 15 minutes. You can tie up your hair and put on a shower cap to avoid making a mess. Afterward, wash your hair using a mild shampoo and tepid or lukewarm water. 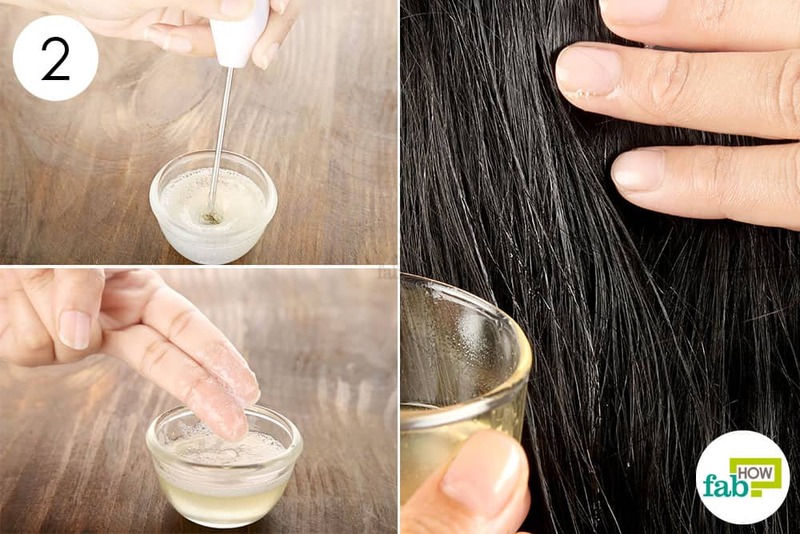 Apply this coconut oil hair mask once a week to get longer and stronger hair. 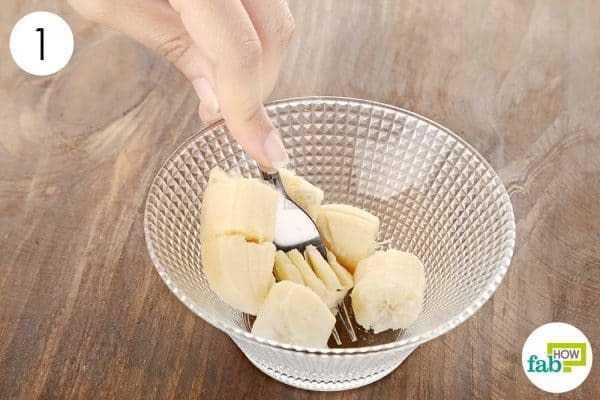 Bananas are rich in potassium and other natural minerals. This tropical fruit works to moisturize and strengthen your hair, restoring its natural elasticity to prevent breakage. 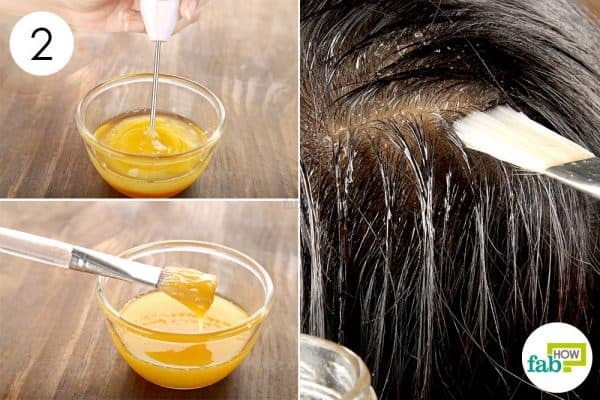 Honey is a strong antibacterial agent and can be used successfully to get rid of scalp infections and dandruff. This thick, amber liquid is also rich in vital nutrients like B vitamins, iron and zinc that enrich and nourish your hair. 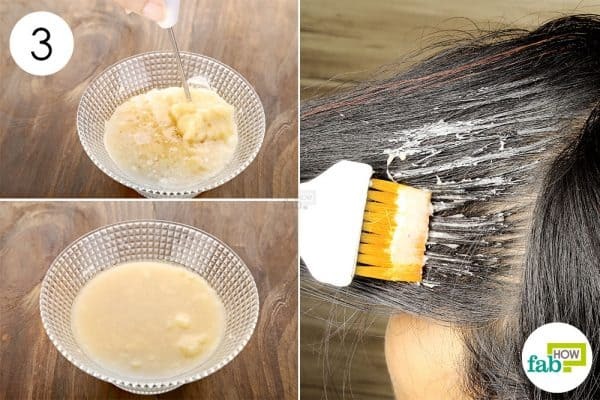 This DIY coconut oil hair mask is the perfect remedy to get rid of an itchy, flaky scalp and deeply condition your hair. Caution: Always use a ripe banana that is easy to mash and blend. If the mask is not smooth, it might cause trouble for you to wash it off. Mash pieces of a ripe banana using a fork. Keep mashing until you reduce the solid fruit to a pulp. Add 1 tablespoon of extra-virgin coconut oil to the mashed banana. Add 2 tablespoons of coconut milk. Use a motorized hand blender to whisk all the ingredients into a smooth paste. 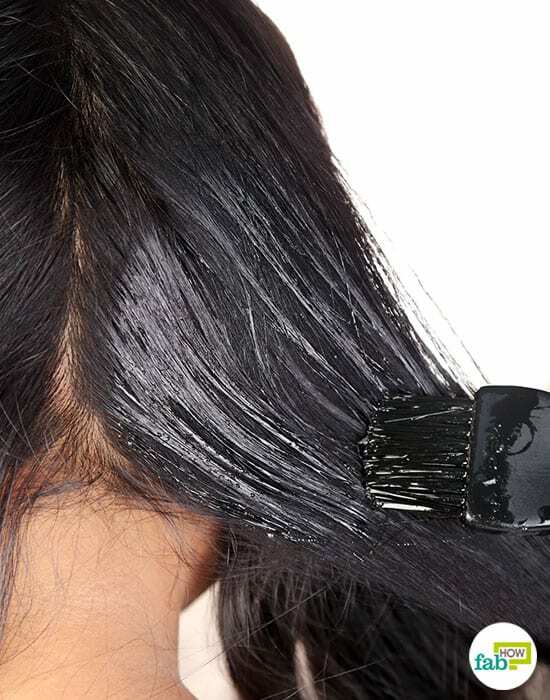 Use a hair dye brush to apply the mask all over your hair. You may find the task easier if you partition your hair into sections and apply the mask on one section at a time. After application, you can roll up your hair and put on a shower cap to avoid creating a mess in case some of the mixture drizzles down. Leave it on for 30 minutes to 2 hours, depending on your convenience. The longer you keep it on, the greater benefits will you reap. Wash your hair using a mild shampoo and lukewarm water. 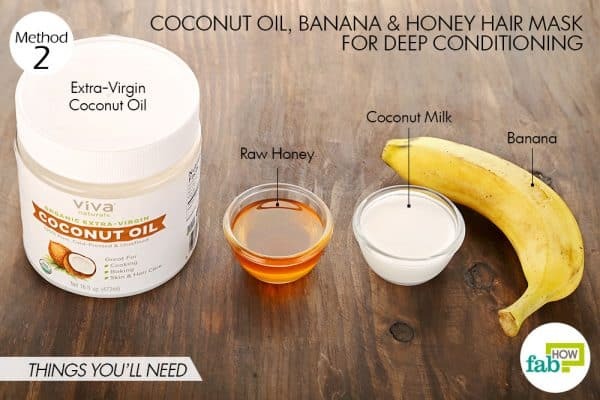 You can apply this deep conditioning coconut oil hair mask once a week to hydrate and nourish your hair. Regular use will give you stunning, voluminous locks. 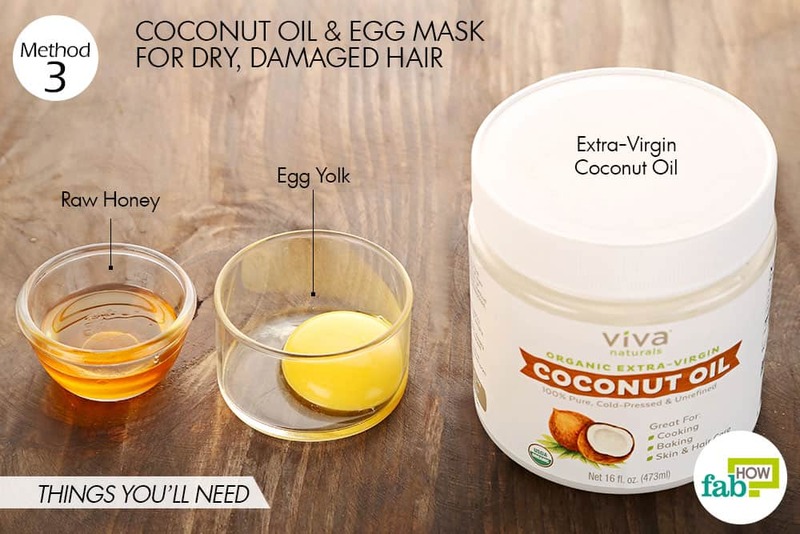 If your hair is severely damaged, dull and lifeless, this coconut oil, egg yolk and honey hair mask is the perfect treatment for you. The yellow egg yolk is rich in proteins and vital nutrients. It enriches your hair roots and individual strands to promote hair strength and volume. As your locks absorb the nutrients and proteins, your hair will become softer, stronger and shinier. Put 2 tablespoons of coconut oil in a mixing bowl. Use a cosmetic brush to apply the mask on your hair, covering the strands from the roots to the tips. After application, use your fingertips to gently massage the hair mask into your scalp for at least 2 minutes. You should ideally leave on this mask for 1 hour. However, if you’re in a rush, you can wash it off after 30 minutes. Wash your hair with lukewarm water and a mild, gently cleansing shampoo. You can apply this coconut oil hair mask once or twice a week to rejuvenate your dry, damaged and lifeless hair. While you will notice a major difference in your hair quality after the first application, regular use for at least 2 to 3 months will give you gorgeous, Cosmopolitan-worthy locks. Dandruff can be extremely embarrassing, as the ever-present, white flakes make your condition pretty obvious. 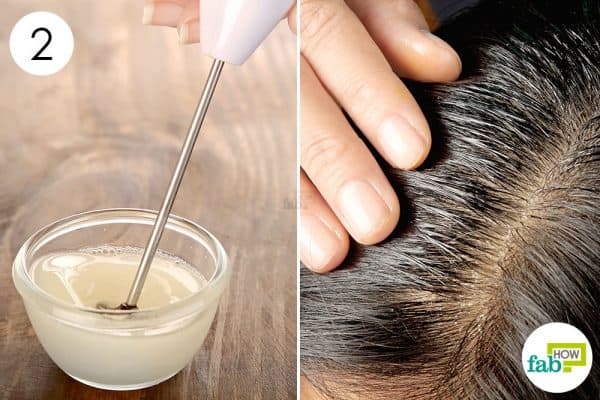 If left untreated, this condition can lead to scalp infections like seborrheic dermatitis, which can cause severe hair loss and even bald patches. 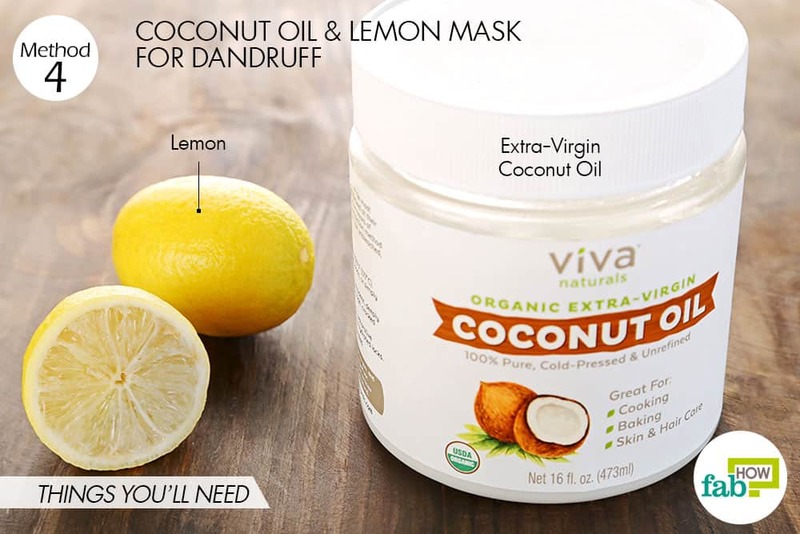 Lemon, which contains vitamin C, nourishes your scalp and helps clear off all the dead, flaky skin and any fungal infection that may be responsible for the dandruff. Lemon juice also works to reduce the oiliness on your scalp, helping to remove the oily grease and accumulated dirt that may be blocking your hair follicles. 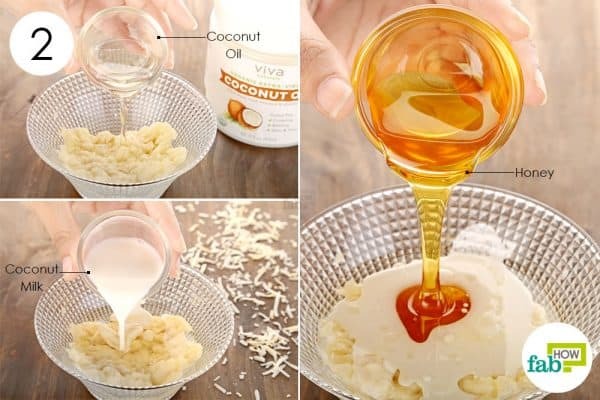 Put 1 tablespoon of melted, extra-virgin coconut oil in a mixing bowl. 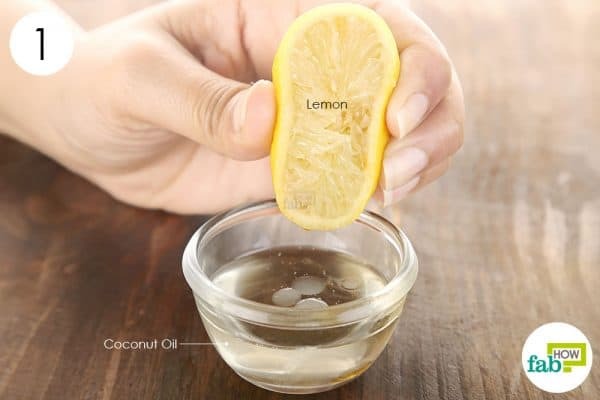 Squeeze the fresh juice out of ½ of a medium-sized lemon into the oil. Use a small, motorized blender or a fork to whisk the two ingredients together to get a uniform blend. 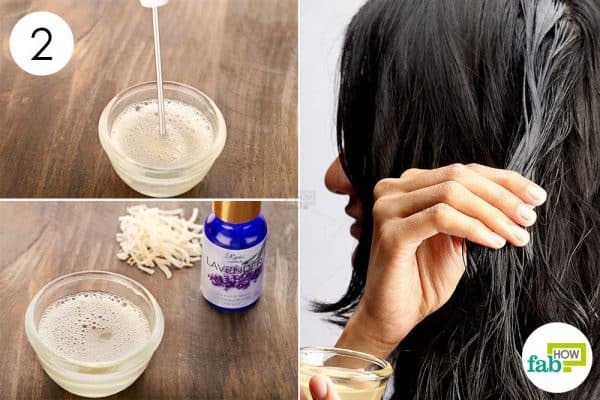 Massage the blend into your scalp and hair. Leave it on for about 15 minutes, then wash your hair with lukewarm or tepid water. Use a towel to soak up excess moisture from your hair, then let it air-dry naturally for best results. You can apply this coconut-lemon hair mask once a week to hydrate and nourish your dry scalp to get rid of dandruff. 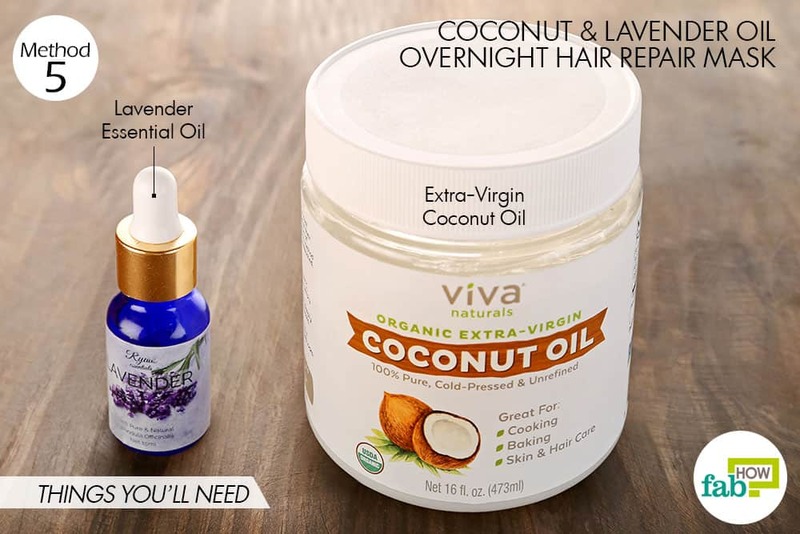 For hair that has been damaged by repeated coloring and heat-based straightening or curling, we recommend using this coconut and lavender oil hair repair mask. 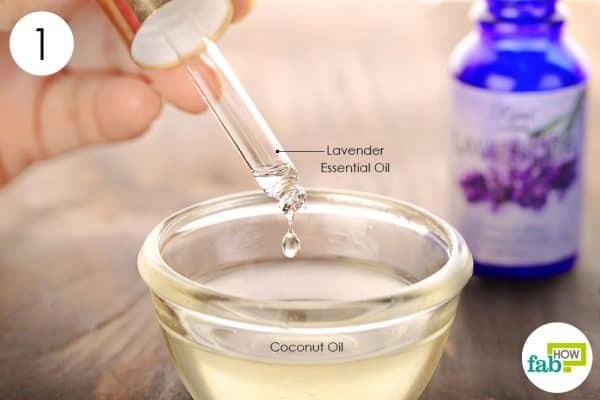 Add 5 to 7 drops of lavender essential oil. Whisk the ingredients well to get a uniform blend. Leave it on overnight. You can cover your head with a shower cap or tie up your hair with a piece of cloth to avoid dirtying your bed linens. Wash it out in the morning with coconut milk shampoo, and follow it up a coconut cream conditioner for optimum results. You can apply this overnight hair repair mask on a weekly basis for at least 2 to 3 months to undo the damage caused by years of chemical and heat-based hair styling. 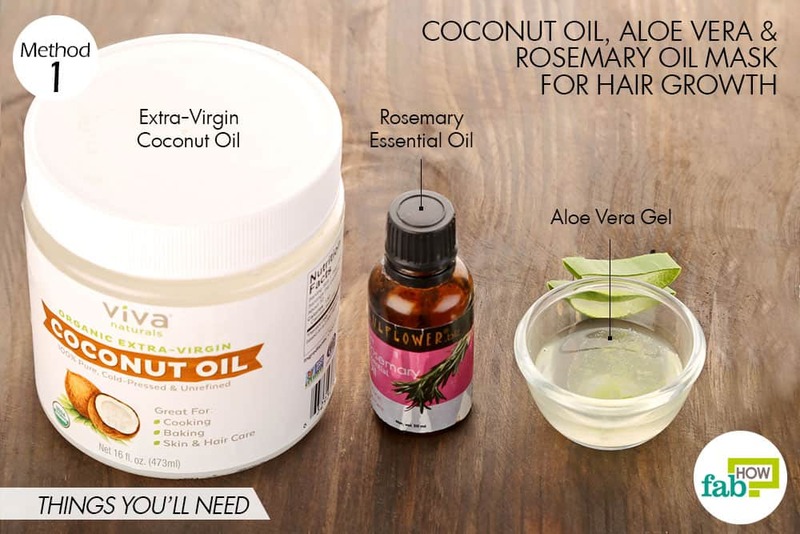 You can prepare and apply this incredibly simple but highly effective blend to successfully tame unruly, rough or frizzy hair. Put 1 tablespoon of melted, extra-virgin coconut oil in a small mixing bowl. 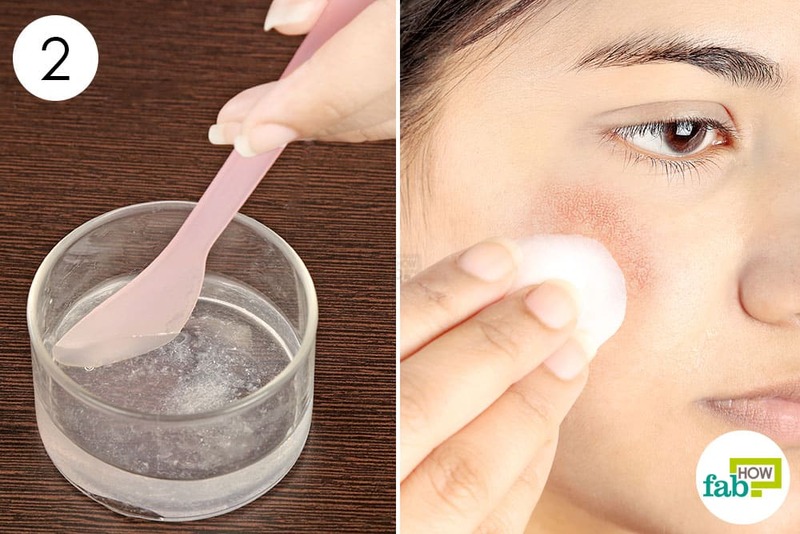 Add ½ teaspoon of vitamin E oil as well. Whisk thoroughly to get a uniform mixture. Use your fingertips to gently massage the mask into your scalp and hair. Leave it on for 40 minutes, then wash your hair with shampoo and lukewarm water. 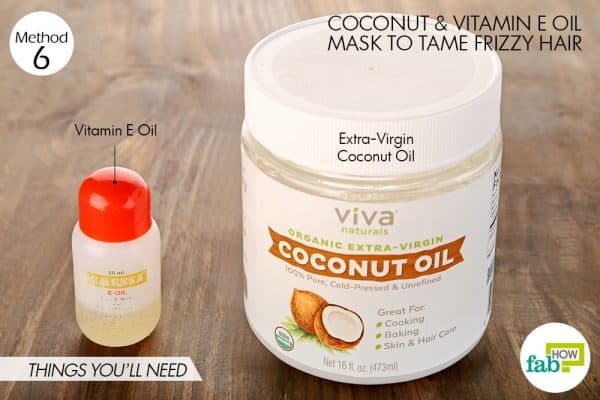 Apply this coconut oil hair mask twice a week to tame unruly or frizzy hair. 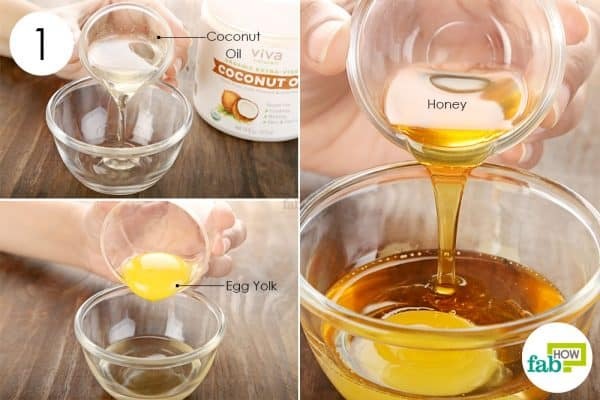 You can also mix equal amounts of castor and coconut oils, warm it up and massage it into your scalp and hair to boost hair growth; just leave it on overnight and wash your hair in the morning. You can also massage hot or warm pure, extra-virgin coconut oil into your hair on a weekly basis to maintain hair health and volume; keep it on for around an hour and then wash your hair with a mild shampoo. 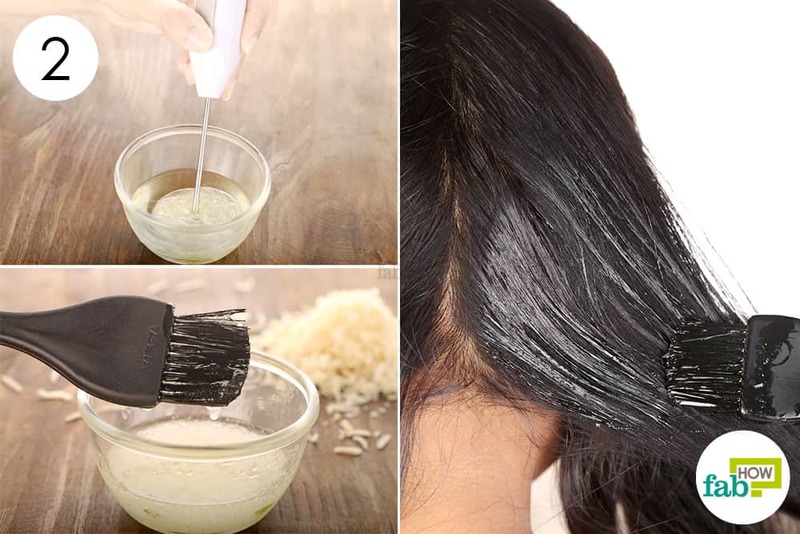 Another excellent remedy for frizzy hair involves applying a blend of 1 tablespoon coconut oil, half an avocado and 1 tablespoon olive oil to your hair and washing it off after 1 to 2 hours. You can prepare the oil blends with essential oil and vitamin e and keep it for months. But for the masks with other natural ingredients, we’d suggest you to prepare them afresh before application for best results. As they have perishable ingredients like banana, egg etc which go bad in no time.